"The masters return! The new edition of this definitive treatment of the markets for distressed and bankrupt debt reflects the dramatic recent changes in the market, including the implications of the amazing episode of defaults that occurred in 2001 2002. The authors continue to provide depth and breadth of coverage, including in–depth analyses of default prediction and recovery in default. The book will be particularly valuable for MBA students and professional investors." "After thirty years of distressed securities investing, I was pleasantly surprised that I learned something new from every chapter of this book. It should be required reading for everyone from students to the most experienced practitioner." "A must–read for business students and professionals involved with corporate bonds or loans. Altman and Hotchkiss do an excellent job of covering a broad range of aspects of corporate distress. The information is indispensable for investors and executives alike." "All who work, study, invest, or otherwise find themselves involved with this topic will want to add this book to their library. I certainly will." 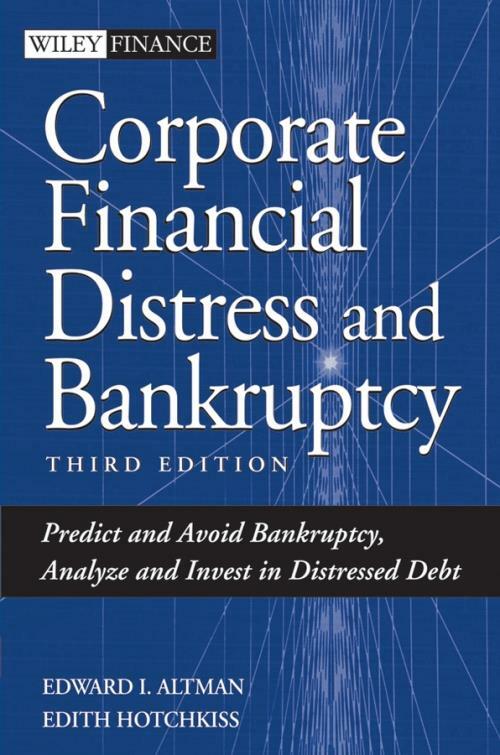 "Corporate Financial Distress and Bankruptcy is an invaluable compendium of methodology, data, and history. The authors do a splendid job of explaining theory to the practitioner and the practical side of bankruptcy to theoreticians." "A thorough, comprehensive treatment of corporate financial distress and credit risk by long–standing experts in the field. Invaluable for those involved in fixed–income securities and in distress restructuring." "Altman and Hotchkiss have updated the leading text on bankruptcy, risk–return relationships for distressed debt, and the theory and application of distress prediction models." PART ONE: The Legal, Economic, and Investment Dimensions of Corporate Bankruptcy and Distressed Restructurings. Chapter 1: Corporate Distress: Introduction and Statistical Background. Chapter 2: Evolution of the Bankruptcy Process in the United States and International Comparisons. Chapter 3: Post Chapter 11 Performance. Chapter 4: The Costs of Bankruptcy. Chapter 5: Distressed Firm Valuation. Chapter 6: Firm Valuation and Corporate Leveraged Restructuring. Chapter 7: The High Yield Bond Market: Risks and Returns for Investors and Analysts. Chapter 8: Investing in Distressed Securities. Chapter 9: Risk–Return Performance of Defaulted Bonds and Bank Loans. Chapter 10: Corporate Governance in Distressed Firms. PART TWO: Techniques for the Classification and Prediction of Corporate Financial Distress and Their Applications. Chapter 11: Corporate Credit Scoring Insolvency Risk Models. Chapter 12: An Emerging Market Credit Scoring System for Corporates. Chapter 13: Application of Distress Prediction Models. Chapter 14: Distress Prediction Models: Catalysts for Constructive Change Managing a Financial Turnaround. Chapter 15: Estimating Recovery Rates on Defaulted Debt.